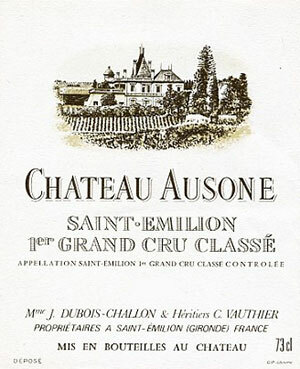 The 2009 Ausone, was produced at probably twice the yields of the absolutely remarkable 2008, but is another profound effort from Vauthier. Dense purple in color, with an almost liqueur of limestone intermixed with acacia flowers, blueberry, raspberry, and boysenberry fruit, the use of 100% new oak is completely concealed by the wealth of fruit and the lavish richness this wine exhibits. Nevertheless, there is a striking precision, minerality, and purity to Ausone. This wine might be far more drinkable in 7-8 years than the 2005 or 2008 will be with the same amount of aging. Nevertheless, any person lucky enough to latch on to one of the 1200 or so cases of this wine should realize it is going to evolve for 20-50 years. (Tasted once.) Two more brilliant wines from Alain Vauthier, but you might have to forgive me for not giving a potentially perfect score in 2009. Readers (and I) have been spoiled by my reviews of 2008, 2005, 2003, and 2000. Certainly, his 2009 may turn out to be as riveting, but at this stage, I would have to rate all those vintages just a notch or two higher.